Alternative “shadow” reporting is a well-established tool of civil society to hold governments accountable to their commitments. 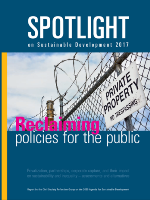 A number of CSOs have prepared shadow or spotlight reports to follow-up on their governments efforts to implement the 2030-Agenda. Stalled, or slipping back, is the theme that appears in many of the contributions. Natural and un-natural disasters, some of them of catastrophic proportions, appear again and again not just as an obstacle to faster progress towards the agreed goals, but in fact setting the clock back. Part of the reason for lack of progress has to do with an over-reliance on public-private partnerships, urged by the World Bank as a way to finance implementation of the SDGs. Come join the authors of national shadow reports in a conversation about their experiences.